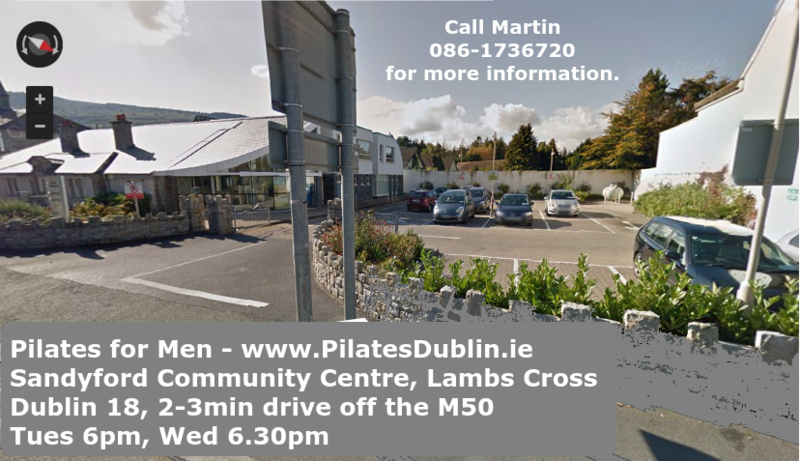 My Mens Pilates & Core Strength Classes are small 8-10 participants max. and take place in the greater South Dublin Dundrum, Sandyford, Leopardstown, close to Bellarmine, near Aiken Village, Kilternan, Stepaside, Ballinteer, Carrickmines, Cabinteely, Foxrock, Churchtown, Stillorgan, Foxrock, Dublin 14, Dublin 16, Dublin 18, D14, D16, D18. mid-20s to mid-70s. I’m teaching Pilates & Core Strength courses and various other fitness and exercise classes since 2002. 3. Tuesday 8.15pm-9.15pm: Dundrum, Taney Parish Centre, beside the Dundrum LUAS bridge (see (1) Map, (2) Street-View). The Gallops, Sandyford Hall, Belarmine, Kilternan on the Road to Stepaside, Enniskerry. 1.3. Level: All Levels, Ages, Beginners are Welcome! 1.4. Classes are small, places are limited to 8-10 participants per course. Click on the picture below to see the class venue or find a map and street view here (1) Map, (2) Street-View. 2.3. Level: All Levels, Ages, Beginners are Welcome! 2.4. Classes are small, places are limited to 8-10 participants per class. close to Goatstown, near Churchtown, Nutgrove, Stillorgan, Clonskeagh, Leopardstown and Sandyford. want to join this class. I assume you don’t have any back issues or other issues. 3.4. Places are limited to 8-10 participants per class. (pro-rata if an 7-week course has already started). Join to get Fitter, Trimmer and Stronger! Contact Martin for further information or with any questions you might have.